Media Agencies: please contact editor@headache.com.au to arrange further discussion. HEADACHES and migraines affect up to 20 per cent of the population, in Australia as well as many other western countries. â€œHead pain is often cited as the most common reason people seek health expert assistance,â€ Dr Jerome Dixon Chiropractor and Editor of headache.com.au said. Dixon is the editor of leading health website headache.com.au and was commenting on the results of a recent US survey (published in the journal of internal medicine) which concluded that CT and MRI scans are overprescribed in the US. The US study reported that these scans demonstrated problems in only 1 to 3% of cases. Doctors in the US suspect such scans were probably prescribed more for patient reassurance, rather than a requirement for the diagnosis. â€œSimilar over prescription of scans occurs here in Australia, and for similar reasonsâ€; according to Dixon. â€œCommonly patients anticipate the worst case scenario, but fortunately serious problems are rare. The history provides the diagnosis in the vast majority of cases” according to Dixon. Practitioners are often compelled to provide scans to reassure the patient, he said. There is a huge cost on the healthcare system for over prescription of such procedures. Our 2014 Survey focused on the success rates and costs associated with head pain diagnosis. 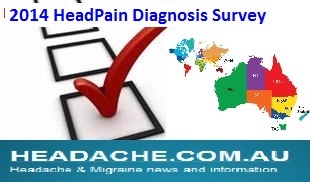 The survey can be found at: http://headache.com.au/survey2014 and ran until Dec 2014. Dr Dixon said health professionals who thought laterally knew that most headaches and migraines had more than one cause. â€œToo often sufferers are diagnosed with a â€˜common headacheâ€™ or â€˜common migraineâ€™ after lots of scans, only to be told to take medications, when they can do so much moreâ€ he said. â€œThe fact is that most sufferers can be helped by looking for underlying causes, usually not pathology, but poor functionality, leading to irritability in the head, neck, jaw, or even systemically. â€œCommon examples include neck tension, jaw clenching, eyestrain, poor blood sugar level regulation, food triggers, sinusitis, tension and stress and dehydration. â€œIt is important to rule out pathology, but not to limit therapy to scans and medicating for symptoms only when the treatment can usually be taken so much further into addressing the underlying causes.â€ He also reiterated the importance of a professional diagnosis and specialised approach. The Survey ran till Dec 2014 with final results now available. For further information and editorial please contact the editor below. Footnote: Headache.com.au editor Dr Jerome Dixon graduated from RMIT Chiropractic in 1994, having completed a science degree majoring in Biochemistry, undergraduate studies in Dietetics at Deakin University; and post graduate studies in headache and migraine management. www.headache.com.au was designed and launched in 2000 due to a need for health care professionals to provide a range of expertise, and work together on individuals suffering head pain, especially where a combination of triggers exists. The site is unique as it brings together the expertise of: Pharmacists; Optometrists; Chiropractors; Ear, Nose and Throat specialists; Neurologists; Orthodontists; Psychologists and Dentists. www.headache.com.au is an independent and unbiased, group of key health professionals.